In 2004, the German manufacturer created a very special version of one of its most representative models for Pisa: the limited-edition Datograph. 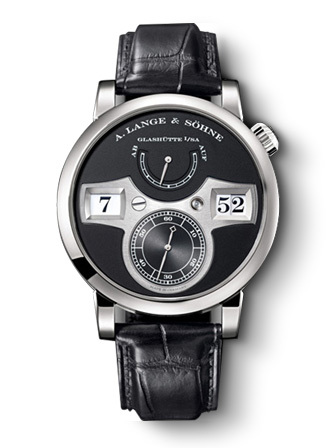 The Lange & Söhne Datograph was launched in 1999 and immediately became one of the leading high-end chronographs, partly thanks to the L951.1 movement made up of a total of 390 components. In 2011, the Saxon manufacturer introduced a new version, with some updates compared to the original series that Pisa’s “Albino” is part of. The first Datograph series features a manual winding movement with a 39 mm platinum case and takes its name from the two most obvious complications: a big date at 12 o’clock and the chronograph function with a characteristic flyback. 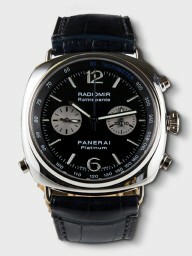 In addition, the dial features chronograph small second and minute indicators, with a special instant minute counter. There is button for quickly setting the date on the “middle case” at 10 o’clock. 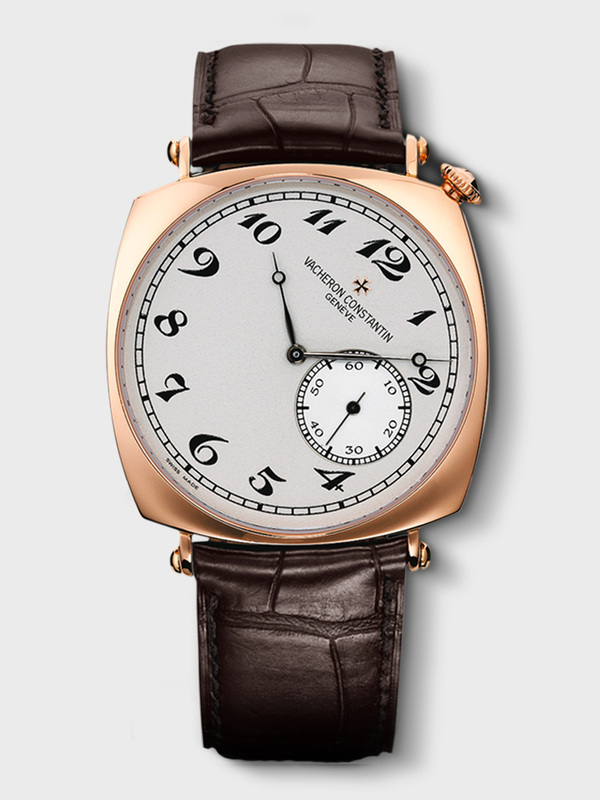 Only 10 copies were made of the version created for Pisa, which has unique features while maintaining the fundamental characteristics such as the platinum case and applied Roman numerals: above all, the “silvered” dial in contrast with the classic black. Hence the nickname “Albino”. In addition, the numbering from 1 to 10 and the word Pisa are shown on the back of the case, which is mounted on a transparent case back. 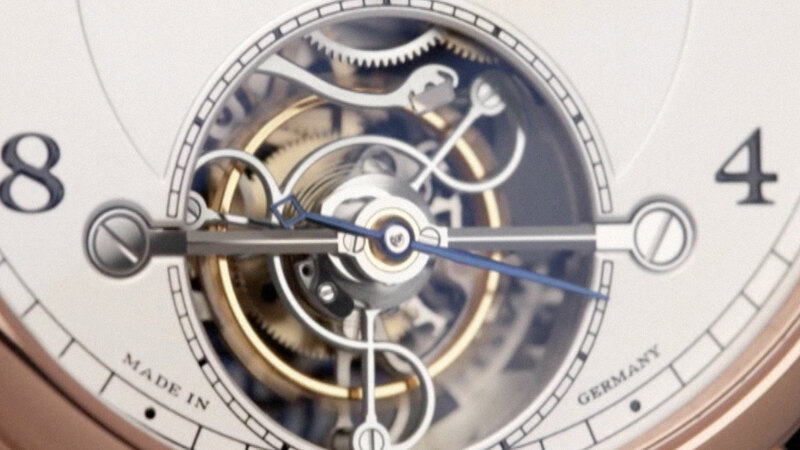 An exclusive feature of the Albino is the additional solid platinum case back provided along with the guarantee, which bears the original signature of Walter Lange, the great-grandson of Ferdinand Adolph, the founder of the manufactory. Highly popular among both customers and experts in the sector, the limited series was completely sold out. 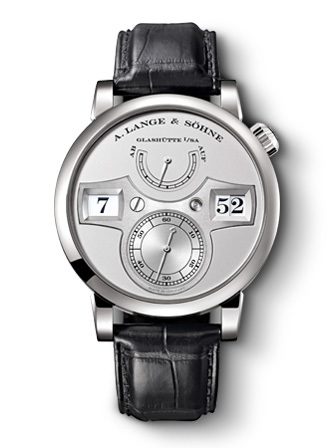 In 2009, Lange & Söhne set another milestone by presenting a "jumping" mechanical numerical indicator of a graphic purity never before achieved. The name of the watch is programmatic: “Zeitwerk” in German roughly means “time work” and symbolises uncompromising clarity; with a slight click, the minute indicator “jumps” exactly from one minute to the next in a fraction of a second; when the hour strikes, the watch makes the “great leap” and all three numerical discs advance, in perfect unity. A new design language means rebirth: the “hour bridge” made from “natural” nickel silver stretches across the entire width of the dial, mounting the large figures of the hour and minute indicators, placed side by side. It also embraces the auxiliary small seconds sub-dial at the bottom and the continuous power reserve indicator at the top (36 hours). The high energy needed to advance all three timekeeping discs synchronously on the hour is provided by a newly designed barrel with a powerful mainspring. Its structure, also patented, literally reverses the known principle of winding and unwinding: the barrel’s bearing is subject to greater friction when winding the watch. Between the barrel and the balance wheel, a patented tensioning mechanism acts as a regulator for the forward jump of the hours and minutes: a construction probably unparalleled in a system of this size. To absorb the forces generated in accelerating and braking the numeric discs, which are extremely large compared to the watch’s movement, a “wind turbine” was integrated into the construction. The aerodynamic drag that opposes its rotation absorbs a substantial percentage of the energy, enabling the discs to be advanced in a controlled manner. With its aesthetic values ​​and the inner mechanisms, Zeitwerk always gives a novel perception of time, whichever version of the case (pink gold, white gold, platinum, and yellow gold) and the dial (solid champagne silver, solid black silver, silver-coloured solid silver, solid rhodium silver) you choose. To celebrate 60 years of Pisa Orologeria in 2005, 2006 saw Officine Panerai, a leading historic Italian brand in global high-end watchmaking, create a limited edition watch to celebrate the continuous and constant evolution of Pisa Orologeria over the last six decades. 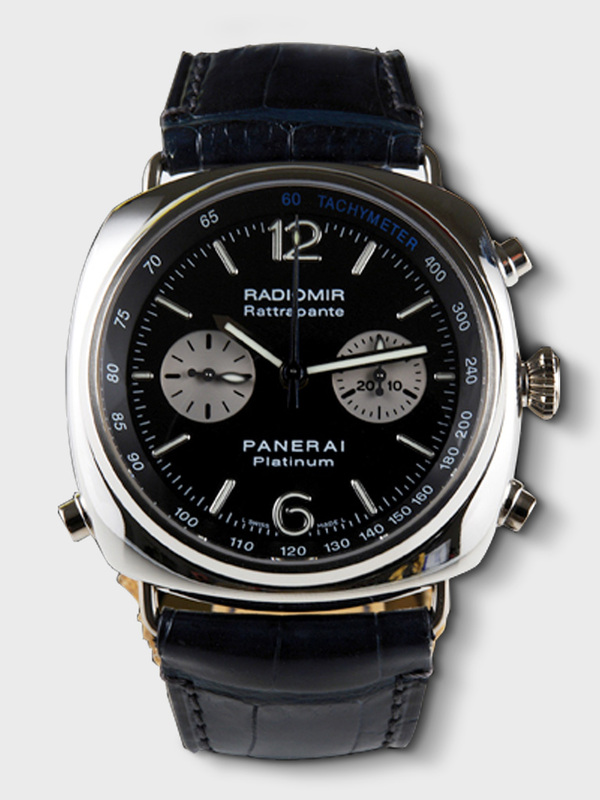 The Radiomir Chrono Rattrappante comes with an automatic mechanical movement, Panerai OP XVIII calibre, and a power reserve of 42 hours, and uses the double column wheel system for switching the chronograph functions. The power reserve is 42 hours, and the decoration is Côtes de Genève, the screws are burnished blue. 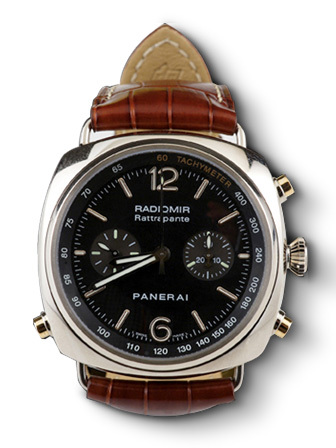 The case has three parts, a diameter of 45 mm, and a removable wire lug (patented by Officine Panerai). 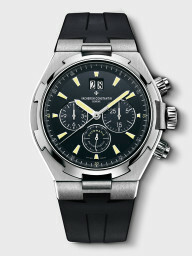 There are chronograph buttons at 2, 4 and 8 o’clock (split-seconds function) and a screw-down winding crown. 1.9 mm-thick sapphire crystal with anti-reflective treatment. Screwed-on case back, guaranteed water-resistant up to 100 meters. The Radiomir Chrono Rattrapante for Pisa Orologeria has an entirely new look, in that the case, with the individual numbering and customisation with the Pisa logo on the back, is made exclusively from precious metal; this rarity is highlighted by the limited total number made: 20 pieces in white gold with pink gold chronograph buttons, and 5 of the watch made with a platinum case. Even the dial adopts a different graphical solution than the traditional steel version in the Panerai catalogue, in that the white gold version features luminescent Arabic numerals with contrasting details in pink gold on a black background, while platinum model has a dial blue. Highly popular among customers, both series have been completely sold out and stocks exhausted. The current division of the globe into 24 zones with different relative times was established in 1884 in Washington, giving rise to a new challenge to create a watch that could measure and display such differences. 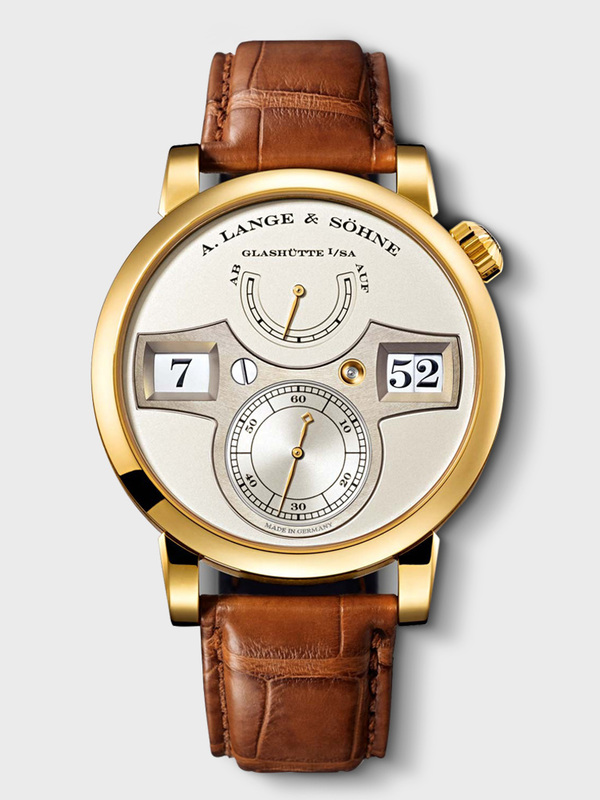 In the 1930s, Louis Cottier – a celebrated independent Genevan watchmaker – designed a mechanism that could show the 24 time zones simultaneously. This mechanism immediately attracted the attention and interest of numerous watchmakers, including Patek Philippe, which would eventually turn World Time into one of its most iconic and admired pieces. Patented in 1959, the novel mechanism enables the watch to show the local time and the time in the world’s 24 time zones simultaneously. Despite the complexity of the self-winding calibre 240 HU, its simplicity of use is exemplary. On the central part of the dial, the hour and minute hands show the local time and are surrounded by two rotating discs. The outer disc shows the names of 24 locations representing the 24 time zones. The inner disc, which rotates anti-clockwise, is set to 24 hours, with a dark portion for the night, marked by a moon, and a light portion for the day, distinguished by the sun. The local time corresponds to the time zone indicated at 12 o’clock. You can read the time in the other 23 time zones at any time on the disc, which bears the names of all the other locations. 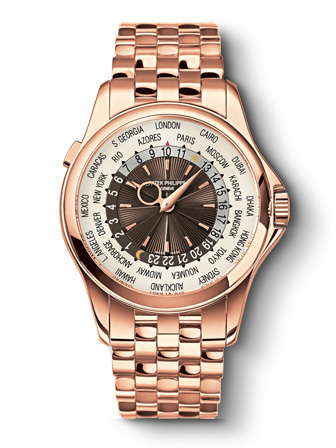 A special setting feature introduced by Patek Philippe makes the World Time special: you don’t need to make any special adjustments to change the time zone, all you have to do is press the button at 10 o’clock; the locations disc will turn one click clockwise, bringing the desired time zone to 12 o’clock. This system not only makes the desired change instantly, but also does not require the mechanism to be stopped, thus ensuring absolute precision. The current Patek Philippe World Time watches (Refs. 5130 and 5131) have a round classic-style case and are available in yellow, pink, or white 18 carat gold or platinum 950. The men’s versions are 39.5 mm in diameter and the women’s models are 36 mm in diameter, ensuring optimum readability while still maintaining a slim, compact profile. 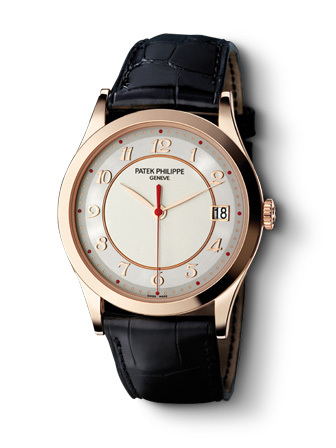 The dial design is inspired by the one of the first World Time watches from the 1930s. 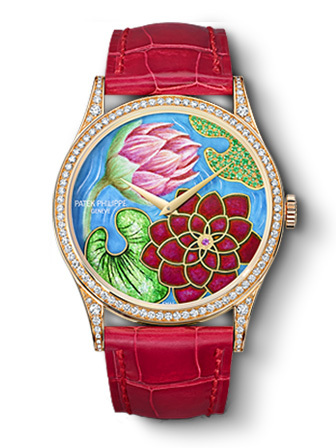 There is a guilloché motif or an enamel cloisonné in the middle. 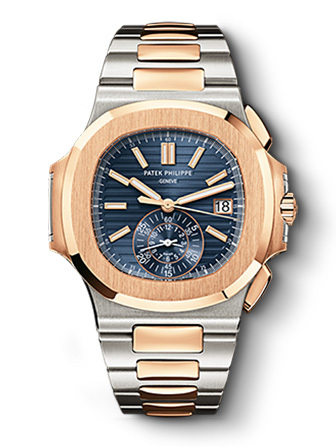 The hour hand on the men’s models has a perforated round shape inspired by historical Patek Philippe World Time models and reserved solely for this type of timepiece. 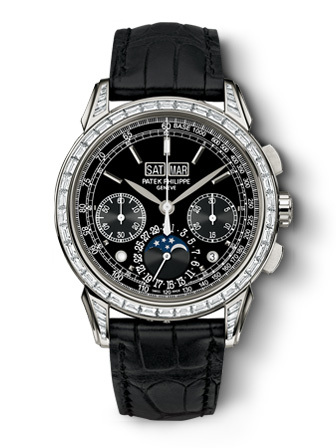 The tribute paid to this family of watches on Patek Philippe’s 175th anniversary is particularly noteworthy: the Ref. 5575G adds a poetic depiction of the phases of the moon to the World Time, thanks to an ultra-thin self-winding movement, the calibre 240 HU LU. A single large moon rotates clockwise in the middle of the dial on the background of a starry sky. Another fixed upper disc is simply a facade that lets you see the visible portion of the moon with extreme precision night after night. Made with a 39.8 mm white gold case in the men’s version, of which only 1300 were produced, the 5575G is accompanied by a ladies’ version (Ref. 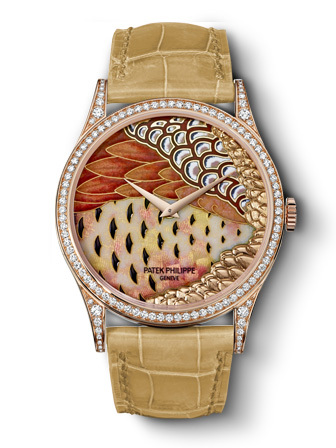 7175) in rose gold with a 38 mm case crowned by 70 0.6 carat diamonds and a silvered dial, of which 450 were made. 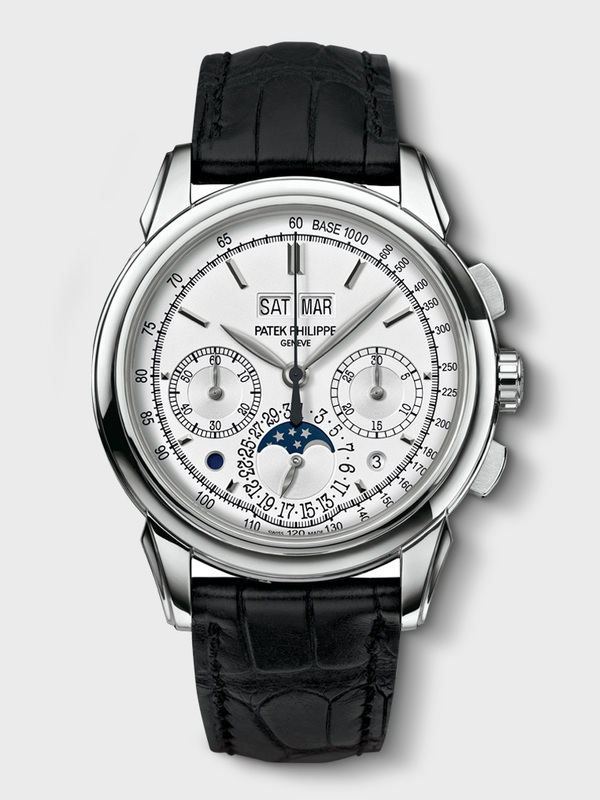 In 2008, on the occasion of the opening of Pisa Orologeria's Patek Philippe boutique at 9 Via Verri in Milan, a limited series was created commemorating the well-established partnership between the Milanese company and the Genevan manufactory. The chosen model was the reference 5296, one of the models in the “Calatrava” family. 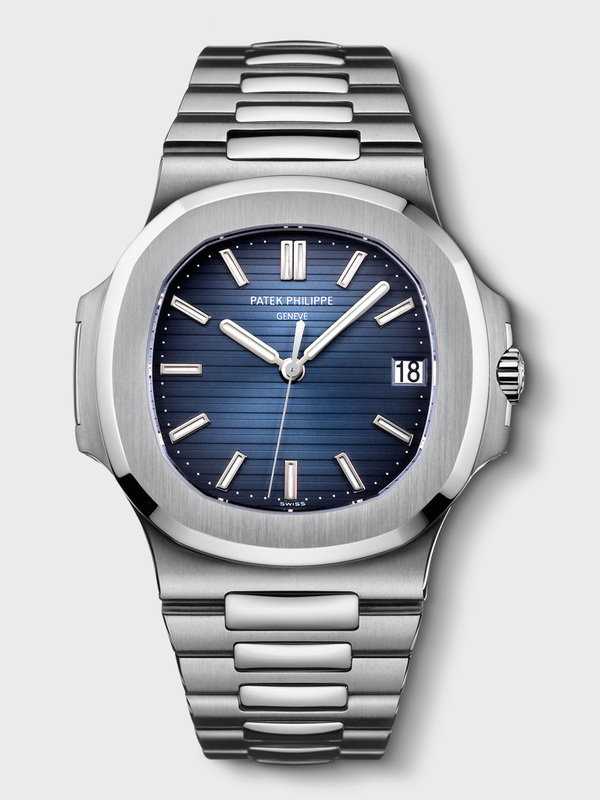 Calatrava was first launched in 1932, and over time has established itself as an icon of Patek Philippe, becoming one of the most long-lived products in the history of watchmaking. The choice not only pays tribute to these decades of success, but also represents a wish for the newly opened boutique. 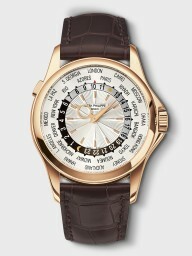 The two versions of the limited series were produced, one in white gold and one in rose gold, comprising 25 pieces each. The watches feature the classic characteristics of the Reference: the calibre 324 S C, the self-winding movement, with seconds in the centre. In addition, all the pieces are numbered on the back (1 to 25) and have a silver dial with “Breguet” numbers and a red second hand. Highly popular among customers, both series sold out in no time. 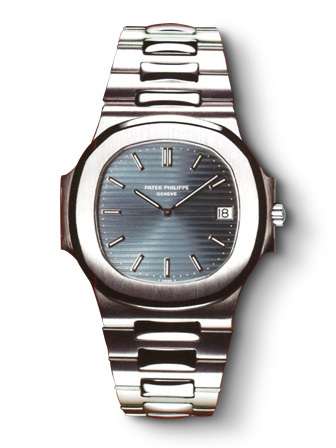 The Nautilus debuted on the market in 1976, and immediately marked a revolution in both the Genevan company and the world of watchmaking in general. 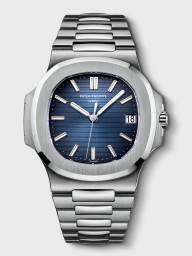 In a period in which watchmaking was still tied to highly classic and conservative stylistic standards, Gerald Genta – who had already designed the Royal Oak for Audemars Piguet – created a model for Patek Philippe that over the years became one of the most identifiable, not only for the workshop, but more generally for the entire sector. 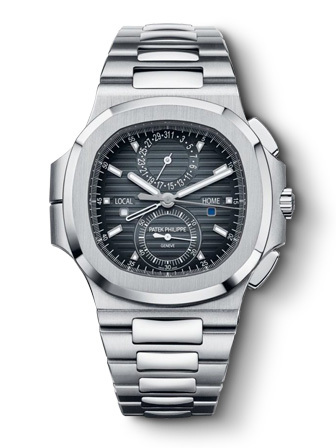 Fine lines and classic shapes were the cornerstones of the watch manufacturers in the ’70s, so the launch of a watch so different was considered a gamble, especially for one of the most classic manufacturers like Patek Philippe, usually associated by the public with round cases and complications, rather than sports watches with shaped cases. 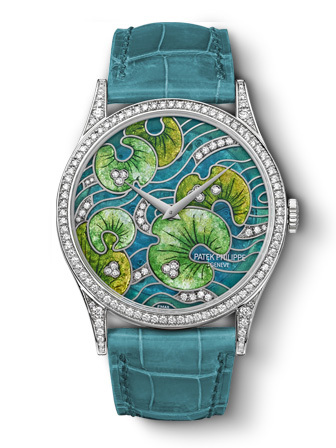 Right from the start, the aim was to create a piece of fine watchmaking, with sporty features but still in keeping with the manufacturer’s principles and historical values: the name itself, “Nautilus”, carries a strong marine connotation and clearly alludes to the inspiration drawn from by diving, as does the case shaped like the porthole of a ship and water-resistant to a depth of 120 meters. The collaboration with Gerald Genta created a new concept: a watch of high-quality but with sports lines, in the price range of classic watches designed for demanding yet dynamic customers. The first Nautilus (Ref. 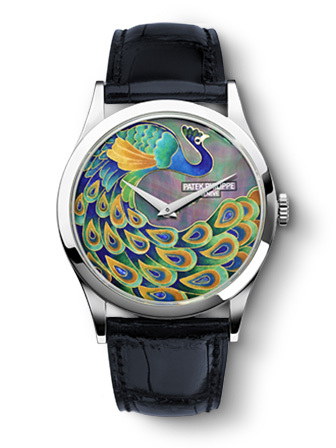 3700) featured a 42 mm single-piece case – an out-of-scale size for the era. The octagonal bezel with rounded corners was screwed laterally onto this case. 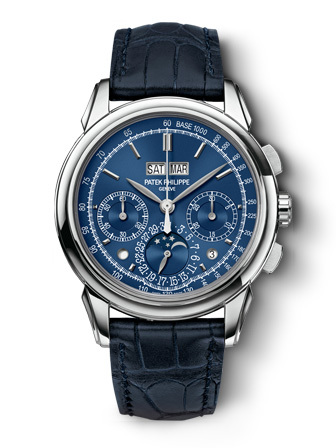 The blue monochrome dial had an unmistakable pattern of horizontal lines with stick-shaped markers and hands. It showed the date at 3 o’clock and was fitted with hour and minutes hands, but no second hand: a hallmark of Gerald Genta. In 1976, the Nautilus was fitted with a calibre 28-255C, derived from the calibre 920 Jaeger Le-Coultre and used by Genta in the first Royal Oak. What makes the mechanism stand out is its thinness of just 3.05 mm. About forty years after the first version, the Nautilus Ref. 5711 features some small variations. The changes that stand out are the second hand and the resulting thicker case, which consists of three parts (the back and middle of the case are separated) with a transparent case back that reveals the calibre 324 S C movement. The dial has a slightly different colour, which reflects different colours depending on the light. Despite the variations, the style has remained unchanged over the years, as has the fascination exerted by this watch, which is still one of the most loved and sought-after by enthusiasts. 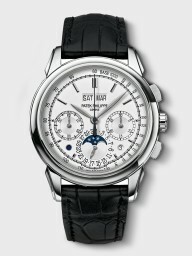 The perpetual calendar chronograph has always been considered one of the more representative models of Patek Philippe. 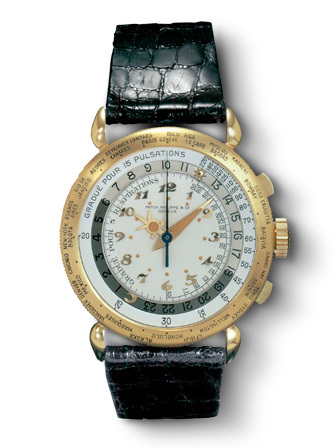 Produced in series by the Geneva Manufacture since 1941, it has been and still is among the most coveted watches by collectors and watchmaking enthusiasts, representing the union between the perpetual calendar–made by Patek Philippe ever since 1925- and a relatively simple complication such as the chronometer with tachymeter. Today’s version, with reference 5270, has its roots in the 80s with the presentation of reference 3970 in 1986. 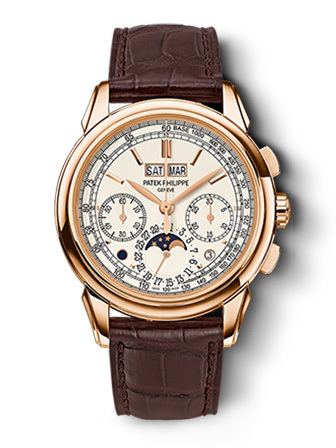 This last one indeed represents the beginning of a new era for this type of watch manufactured by Patek Philippe: unlike its predecessors (Ref. 1518 and Ref. 2499) the 3970 was fitted with a caliber CH 27-70, based on Lemania 2310 movement, but beautifully designed and finished according to the requirements of the Manufacture. 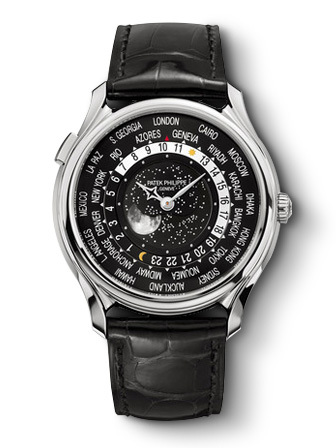 Compared to its predecessors, 3970 presents a case reduced to 36mm with push buttons and produced in three different series over the years, the functionality and the aspect though is the traditional one: day and month indicators in two displays at 12 hours, date and lunar phase indicator at 6 hours, indicator of seconds and indicator of day and night at 9 hours while at 3 hours is a 30 minutes counter for the chronograph, together with leap year indicator. After 19 years of producing 3970, in 4 case versions (white, pink, yellow gold and platinum) with a white or black dial without tachymeter scale, Ref. 5970 is presented. At first sight one can notice a hint at the past compared to 3970: a return to push buttons for the chronograph and a case increased to 40mm diameter, the return of the tachymeter scale interrupted by the lunar phase indicator. This reference, much appreciated by collectors, was the last to mount a Lemania caliber: with the acquisition of ébaucher by Breguet (Swatch Group) Patek Philippe decided to internalize the production of the movement and after only 5 years of life, 5970 was replaced by 5270. The 5270 introduced in 2011 represents the beginning of a new era for this watch series: the manufacture mechanism CH 29-535PS, with six patents, replaces the Lemania derivation, the case expands 1mm arriving at 41 and the dial undergoes some aesthetic changes due to mechanical motivations. Nonetheless, the 5270 follows the line of his predecessor, maintaining the case shape although now thinner and more ample and push buttons for the chronograph. Compared to 5970 however, one immediately notes some stylistic variations: the subdials at 3 and 9 hours are slightly misaligned downwards relatively to the horizontal axis and do not present the day/night and leap year indicators which are now positioned beneath the two subdials: the first through a white or blue disk, the second with a numerical indicator. Furthermore, the tachymeter scale returns to being complete and external to the lunar phase subdial thanks to a flaring downwards. The watch was originally presented in white gold with argenté dial without tachymeter scale and is today available in white gold with blue or white dial –from April 2015- in pink gold with white dial. 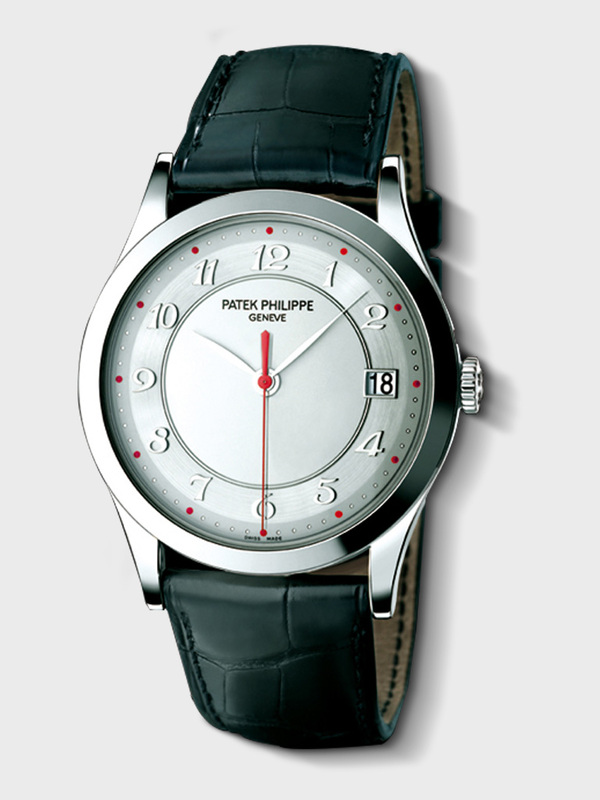 There is also a version in platinum with black dial and diamond baguette (Ref.5271). Since 2014 the 5270 no longer presents flaring on the tachymeter scale at 6 hours. 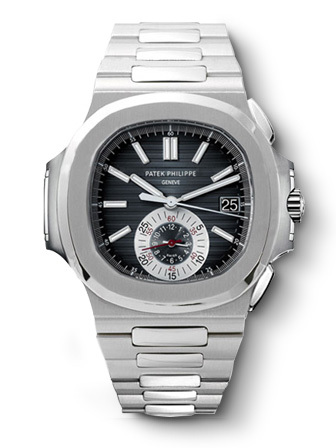 In all of their forms, this family of watches is always among the most admired and desired, with a demand that is clearly higher than the offer, limited by requisites of precision and craftsmanship employed by Patek Philippe in the production of the model that many consider to be their top product. 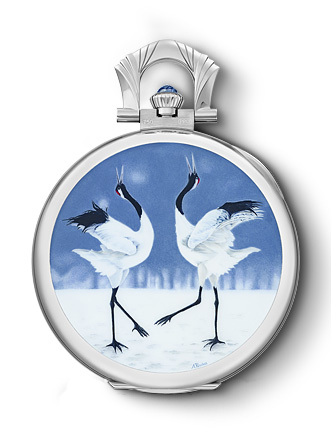 Enamelling has always been one of the most refined and appreciated techniques in the decoration of jewellery and ornaments. 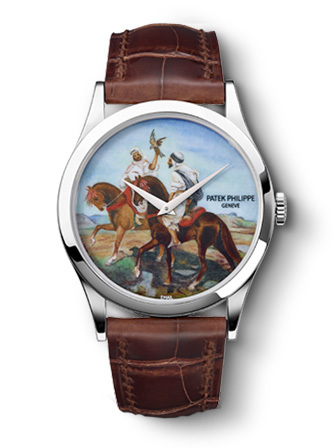 In the watchmaking field, Patek Philippe Manufacture is a master in this art. Enamel is a glassy substance deriving from silica, in origin transparent, that can be dyed by adding oxides of metallic nature. Once it is reduced to powder, the substance is amalgamated with water to create a homogenous paste that can be coated on a duly prepared surface, and then baked at very high temperatures, so as to blend with the surface itself and becoming extremely resistant. 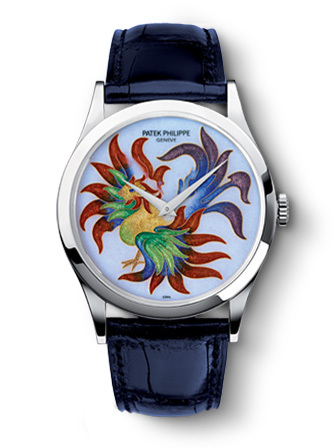 There are four main techniques of enamelling, all extremely complex and all to be found in Patek Philippe watches. 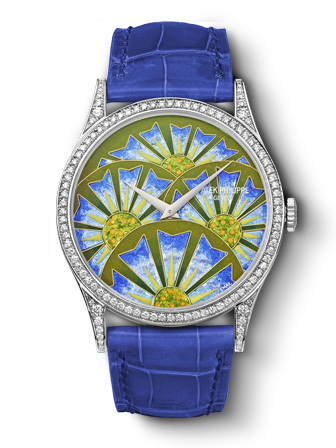 The first technique is “cloisonné” in which a very thin gold foil is shaped according to the desired design on the dial, to which it is then fixed with a first layer of enamel. Subsequently, the cells created by the lamina are filled with enamel chosen accordingly to the colours of the design: often several steps and firings are necessary to reach the desired result. The second technique is the “paillonné” which includes the setting of tiny gold flakes inside the enamel: these specks (paillons) of different shapes are embedded in several layers of transparent or colored enamel, so as to achieve the desired effect. The third technique is the “champlevé”, which is very similar to “cloisonné”: the technique is actually the same, with the only difference that the surface of the cells is engraved previously. This procedure is usually carried out mechanically, as it is very complex. However, in the most particular and unique Patek Philippe pieces, it is entirely hand-engraved by specialists. The fourth technique differs from the other three and is considered the most complicated and rare: the miniature. The enamel is not amalgamated with water but with oil, it is then applied directly onto the base with a very fine brush representing refined portraits, landscapes or scenes. The four techniques may be combined in order to exploit the mix of enamels to create increasingly complex nuances and details. This requires skill, time and patience: just one flaw or a mere speck of dust might mean having to start the process all over again from the beginning. 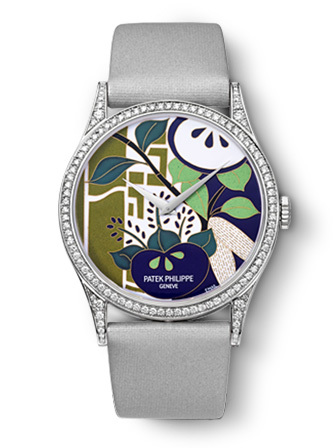 Through the centuries enamelling has become an art typical of Geneva –unfortunately also increasingly rare nowadays – that sees Patek Philippe as one of its most important pioneers. 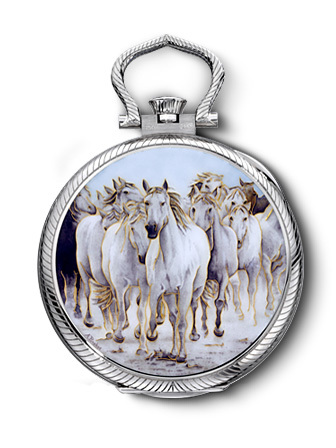 Patek Philippe’s enamel productions are to be found throughout all of its manufacture collections: from small pendulums, to decorative clocks, to wrist timepieces. The latter (Ref.5077) present mainly a Calatrava case with Dauphine watch hands. 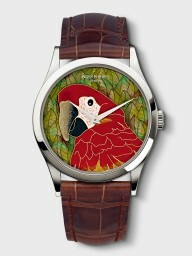 Each year they are presented in limited series with few variations, and are coveted by collectors. The dials in each series have a visual theme centred on nature, animals, and history or are purely decorative. In 2009, a limited edition of the already exclusive reissue of a classic, the Historiques American 1921, was created to celebrate the partnership between the manufactory in Geneva and Pisa Orologeria. The 1921 is a model inspired by a state-of-the-art wristwatch with cushion-shaped case and crown at 1 o’clock that was manufactured by the manufactory in Geneva for the American market during the Roaring Twenties, to which it pays tribute. Inspired by the original, but elegant, “dandy” model par excellence, the watch has a 40 mm cushion-shaped case, which is now available in 18 carat pink gold. Its hallmarks are the way the time is read diagonally and the crown is positioned at 1 o’clock, as in the original version. The dial with a sandblasted finish bears 11 Arabic numerals painted black and a “chemin de fer” small part of the same colour. The “Breguet”-shaped hour and minute hands are made from 18 carat burnished gold. The seconds counter hand at 4 o’clock, on the other hand, is stick-shaped and also made from 18 carat burnished gold. Covered with slightly convex sapphire crystal, the case has a transparent bottom that allows you to see the finishings of the brand-new manual winding calibre 4400, developed and created by Vacheron Constantin and awarded the prestigious Geneva Seal. 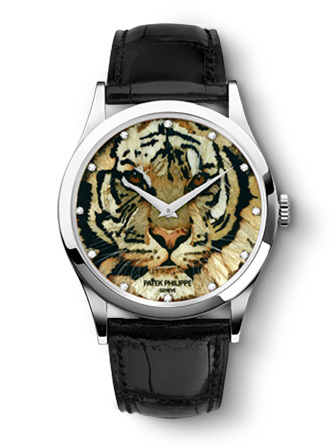 It provides a power reserve of approximately 65 hours and is water-resistant to a depth of 30 meters. 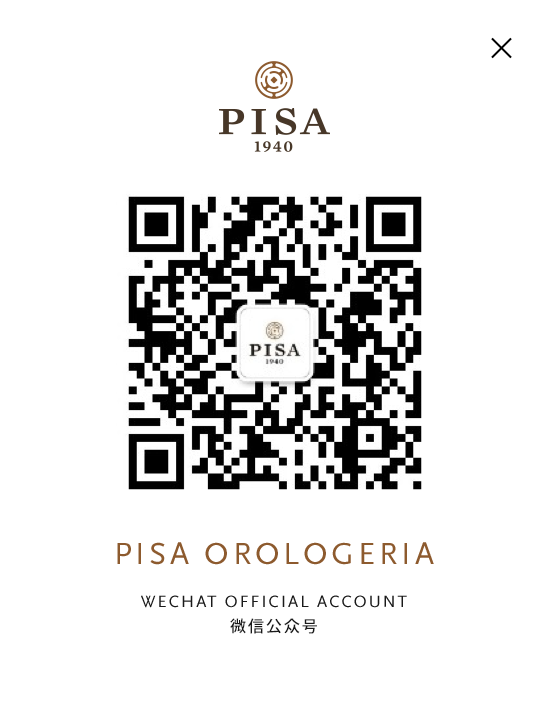 The limited edition for Pisa Orologeria consists of only 12 copies. Compared to the original version, each of these pieces features a red numeral instead of a black one: 12 pieces for 12 numerals… or rather, 11 – the American 1921 does not have a number at 3 o’clock, so copy number 3 has all the numerals in red. Furthermore, each piece has the word “Pisa” both in small writing on the dial in place of the minute markers between the numerals 6 and 7, and on the back of the case, along with the number of the edition. In 2010, Vacheron Constantin paid tribute to the relationships that have always linked the Genevan watchmaking brand to Pisa Orologeria with the Overseas Zero Time Chronograph. The Overseas Time Zero Chronograph is a special edition that arose from a very particular interpretation of the time: the ZERO is in fact the starting point of time, whether for telling the time or counting chronograph seconds. This is why 0 – instead of the traditional 60 – is the number indicated on the rehaut at 12 o’clock at the beginning of the chronograph second count, and Zero Time is the model name that appears inside the seconds sub-dial. This model has a 42 mm brushed stainless steel case, an automatic movement with a big date at 12 o’clock, a chronograph with 30-minute and 12 hour counters, and small seconds at 6 o’clock. Water-resistant to 150m, it features a dial that contains all the customisation arranged with Pisa Orologeria: the bottom is matte black without a guilloché pattern, the counters are white, the markers and hands – as well as the figures 15/30/45 on the rehaut – are coated with a luminescent material in a new and exclusive pale yellow. In further recognition of the strong partnership between the two historic companies in the world of watchmaking, a hidden inscription has been placed inside the dial: the name PISA discreetly inserted in the small parts, between 35 and 40 minutes. 20 copies were produced of the limited series, numbered on the case back. Very popular with customers, the series has been completely sold out and stocks exhausted. In the '90s Lange & Söhne and Pisa Orologeria created an edition so particular that it is still difficult to find information about it. 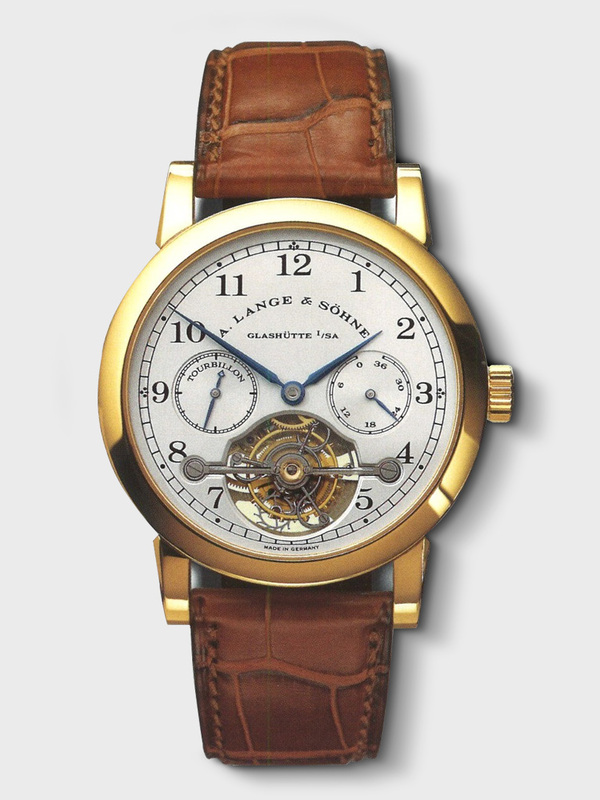 Following the re-unification of Germany in 1989, Lange & Soehne had the opportunity to be relaunched on the watchmaking scene. Pisa Orologeria –in the person of the then Director General Fabio Bertini- took up the first contacts in 1992, becoming one of the first companies to believe in the revival of the Manufacture. The distribution by Pisa of the Glashutte brand began in the early 90s and to date represents a very solid partnership. 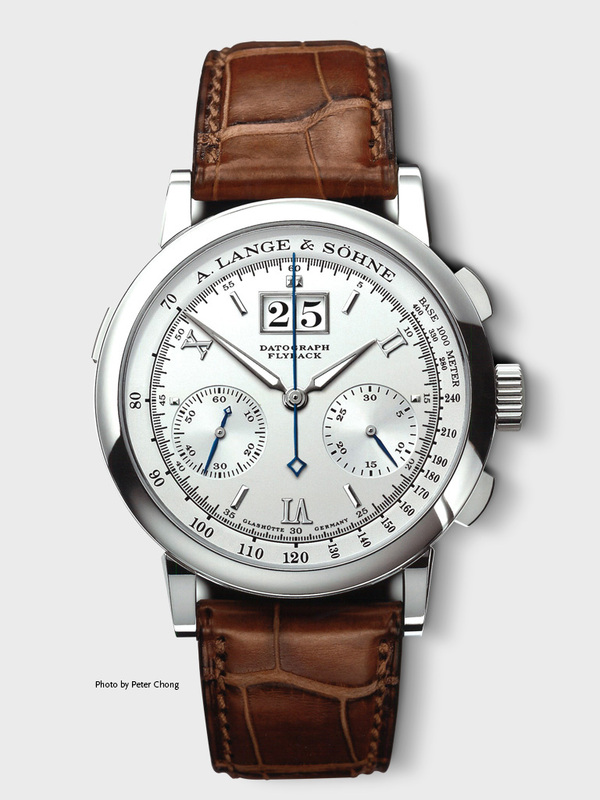 Today the success of Lange & Soehne is visible to all. In the last twenty years there have been watches and movements of very high value coming from the Manufacture, characterized by mechanical complications but also unique and instantly recognizable aesthetics thanks to simple, essential lines. 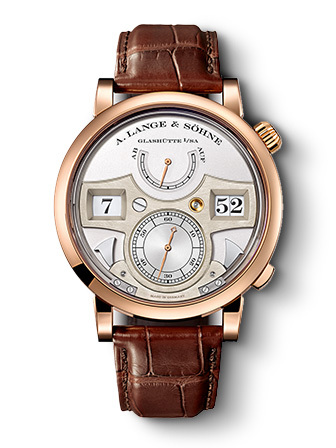 The collaboration between Lange & Soenhe and Pisa Orologeria involves the “Pour le mérite” collection, which is named after the highest German order of merit. The Tourbillon “Pour le mérite” was manufactured between 1994 and 1998 in 50 specimens in platinum and 150 in yellow gold. Within this already limited edition, there is a further, even more exclusive one which does not show pecularities, except for the 316L stainless steel case. Until only a few years ago, at the Manufacture in Glashutte they would have turned up their noses and said with a smile that Lange & Soehne does not manufacture stainless steeel cases, but only ones in precious metals. 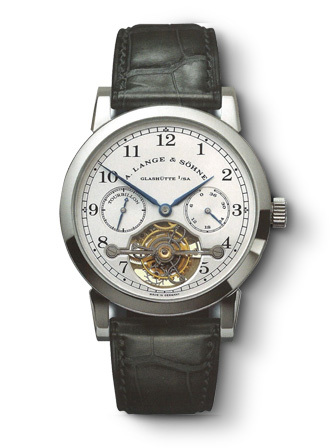 Contacts between Fabio Bertini and Günter Blümlein -at the time President of Les Manufactures Horologères and involved with Walter Lange in the revival of the Company – led to an exchange of views during which the possibility was assessed of also making stainless steel versions. These versions at the time were actually produced in very few specimens, which were delivered to Pisa Orologeria, among them the only Tourbillon produced –with serial number 149/150- in 1996, and sold to a collector who still prefers to remain anonymous. The timepieces were sold, but the stainless steel production was discontinued and those few specimens made were the only ones, and without commemorative inscriptions or engravings. 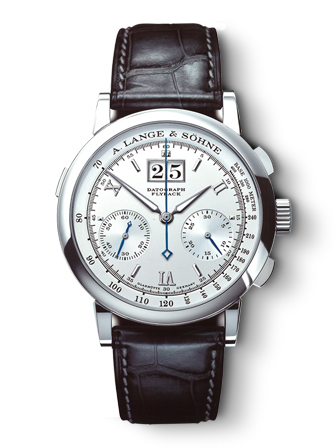 Today, these watches are the most sought after Lange by collectors, for their value and uniqueness. Pisa Orologeria celebrates its 75th Anniversary –and the one of most iconic IWC watch- with a limited edition of 25 pieces of true character. Portugal is a Country of sailors, explorers and traders: marine people, always on the move. People who know the value of Time. It is not a case that two Portuguese traders, Rodrigues and Texeira, towards the end of 1930s demanded to International Watch Co. a wristwatch that guaranteed the same precision of marine chronometers. The history of the “Portuguieser” is therefore strictly connected to a challenge: to insert inside a wristwatch a “savonnette” caliber 74 which –given its size- could only be inserted into pocket watches. IWC accomplished this by creating the first wristwatch with a pocket watch movement. The piece mirrored the needs of the customers, imposing itself as a true avant-garde work: the massive size, the refined dial and the sober round case made it a very unusual watch, very distant from the art déco trends of those times. This pioneering trait relegated the watch to a niche, produced in just a few hundred pieces until the end of 1980’s.1993 marked the large-scale debut of: on the occasion of its own 125th anniversary, IWC launched a special limited edition series called “Portoghese”. 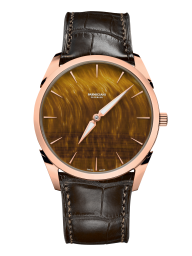 Despite the initial skepticism, the Portuguieser quickly conquered the industry establishing itself as a reference piece. The following years saw the rise of the model range in the watchmaking field, with the addition of several complications and features. Pisa Orologeria celebrates its 75th Anniversary –and the one of this iconic watch- with a limited edition of 25 pieces of true character. The Portuguieser Annual Calendar Edition “Pisa” respects the traits which have made this timepiece great: 44 mm steel case, black dial with “rhodié” hands and black alligator strap. The dial displays small seconds and power reserve, in addition to the complete annual calendar which is located at twelve. The see-through sapphire glass back cover refines the elegant and essential design. Iridescent orange details embellish the dial and the seam on the strap making this version truly unique. This particular coloring recalls one of the historical Pisa traits: orange tones have always been present into Pisa Boutique and derive from the use of “opus signinum”, a noble construction material already used by Romans in architectural works such as the Pantheon. With its essential elegance’s design and its particularly thin profile, the Tonda 1950 satisfies any comfort need as well as clarity in reading time, respecting the fundamental criteria’s of a classis heritage. The Tonda 1950 gives a new interpretation to the essence of the Parmigiani Fleurier’s style. Slim and thin, it enhances the distinctive characteristics of the brand: the four round and ergonomic handles. The Tonda 1950, in white and red gold, is a classic extra-thin model, which defines time with hours, minutes and seconds. The movement PF 701, 30 mm diameter (13 ¼ lines) with a thickness of 2,6 mm only, allows several aesthetic possibilities. The movement, 42 hours power reserve, is provided with an oscillating decentralized micromass in platinum 950. The dial, available in black lead or grainy white colour, marking hours, minutes and seconds, lays the twelve arrow-shaped indexes out with sobriety, hitting an essential beauty. Despite its thin profile, this movement boasts the most valued high watchmaking’s finishing’s, which are frequent in Parmigiani Fleurier’s timepieces, while a few other Maisons commit to respect in this kind of mechanism. The mainplate in Maillechort is sanded, pearlised and then rhodiumed. Its bridges are sanded, drawn or decorated with a Côte de Genève, then hand-beveled and finally rhodiumed. Remarkable is also the esthetical finishing of each gearing, which is beveled, shaped, encircled on both sides and then gilded before cutting. Each component of the Tonda 1950 is entirely realised by the Maison in order to guarantee the maximum accuracy in each detail. The Lapis Lazuli, a metamorphic blue-stone, derived from the presence of lazurite and used since ancient times to embellish jewels and monuments. The Door of Ishtar, in old Babylon, was covered by lapis lazuli which gave to the architectural structure the characteristic blue shade. Tiger eye, a very popular stone in jewellery, which presents a particular reflection if exposed to ray of lights. The meaning of the name “tiger-eye” comes from the fact that this stone resembles the feline’s iris: colours turns from yellow to brown and tan,crossed by magnificent stripe nuances. The Malachite, a green colour stone which does not fade with the time and is used since thousands of years as a material for sculpture. The columns in Saint Isaac’s Cathedral are made of malachite: this stone was broadly used to cover also the rooms in the Winter Palace, in Saint Petersburg.